Too often a teacher either doesn’t understand it himself, or she makes it sound more complicated than it is. This leaves a student struggling with trying to see what is being talked about before giving up frustration. Or worse, the student comes to believe color temperature is not a real thing. 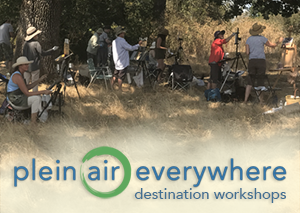 Which is unfortunate, because seeing, understanding, and learning how to accentuate color temperature can transform your work – indoors or out. 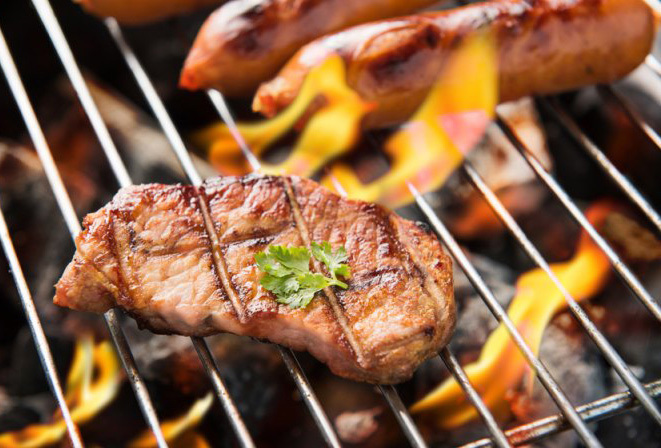 Color temperature is similar to Umami in the sense that once you know it exists you start seeing it everywhere. And when you do, you never stop seeing it again. So okay, how do you start seeing color temperature? First, it is important to understand that color temperature has nothing to do with a single color or hue. A yellow, orange, red, purple, blue, or greens by itself is not inherently warm or cool. Color temperature is defined by the relationship between two or more hues! The relationship between a green and a blue (top left). Between an orange and a purple (middle). And even a red and a slightly different red (bottom left). In all cases, one hue will appear to be warmer or cooler than the other. 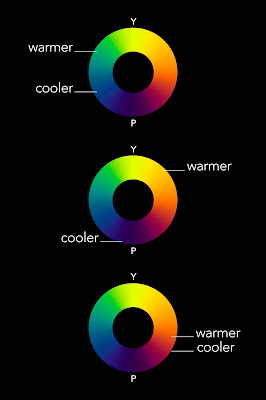 To what degree they will appear to be warmer or cooler depends upon where each hue sits on the color wheel. Or, to be more precise, how close a hue is positioned to the color yellow or purple. The French Impressionists discovered this principle while painting snow outdoors: the hue closest to yellow is the warmer of the two. The hue that sits closest to purple is cooler. It’s really that simple. Okay, so why does this matter? 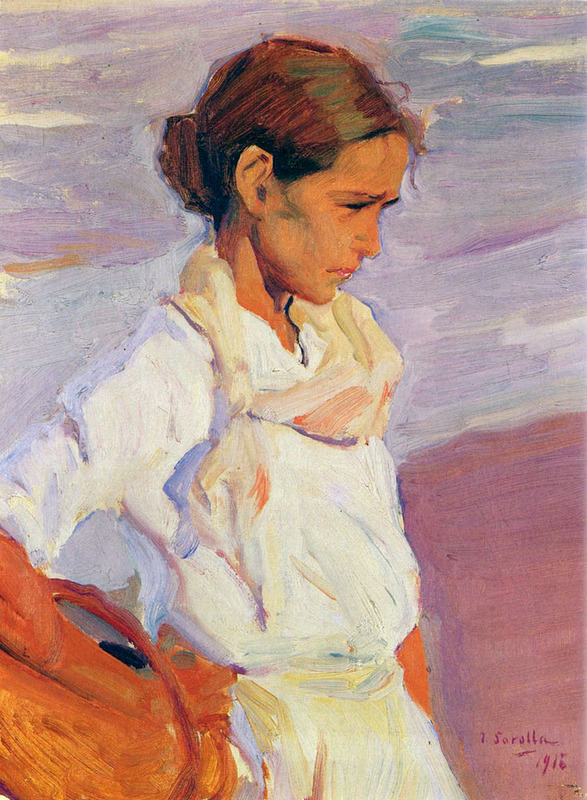 Landscape and figurative painters, such as Sorolla, understood that on a sunny day, the areas of light will appear warmer if the shadows in close proximity are being influenced by the cooler light bouncing in from the sky. Thus, on a sunny day the temperature relationship between a color lit by the sun, and the same color that passes into a shadow, will be warm and cool. For example, if you set out to paint a white shirt going from light into shadow you can see the white in the light contains more yellow; and the white in the shadow is not just darker, it is also a little cooler. The shadow has a bluish/purplish cast (see lower right image). If you maintain this relationship of warm lights/cool shadows consistently throughout the painting you will end up with color harmony – a unified color of light. When you examine Sorolla’s outdoor work you discover he often pushed his colors in the sunlight more towards the yellow than they actually were. And you also learn he pushed the colors in his shadows towards the blue or purple. This warm/cool temperature shift, or ‘push’, forced a greater separation between the light and shadow masses and also created an optical vibration within the eye. This color vibration was a well understood physiological effect called “Simultaneous Contrast in Hue” and it was first exploited to its fullest extent by painters of Sorolla's generation. In fact, Simultaneous Contrast in Hue was one of the principles that launched Impressionism. However, as you continue to examine at Sorolla’s work for this effect you find exceptions to the principle of warm lights/cool shadows. (Nothing is art is ever simple, right?) Yet when you find them they turn out to be logical exceptions, easily explained. Not all light that bounces into a shadow comes from the sky. Some light may be reflecting in from another direction all together. And that light may be of a different color. In Sorolla’s paintings on the left, the sunlight is bouncing up off a beach below onto the underside of the woman's arm. In the middle image, the light can be seen bouncing off the inside of a straw basket that is held tightly against a boy's torso. And on the right, the light is bouncing off the face of a cliff outside the painting, AND bouncing up from the bottom under the water. (Fantastic, yes?) In these three examples the reflected light is so strong it overwhelms the weaker, cooler skylight coming in from above. So exceptions to the warm light/cool shadow principle is limited to specific situations where the color within the shadows are being pushed toward a warmer hue than the sunlight shining down from above. As a result, in comparison, the color of sunlight may appear cooler. Tricky, yes? Well, not really, once you start looking for such exceptions in real life. And, once you do, you begin to see all kinds of colored light bouncing around in the shadows. And of course, when you include such temperature shifts into your own work it will imbue a quality of light everyone will love. 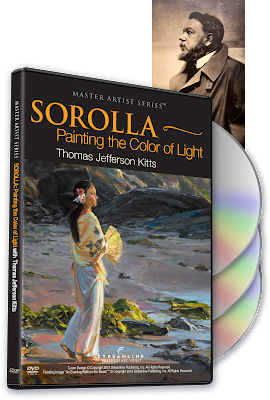 So if you are a painter like me, who is in awe of the genius of Sorolla – or if Sorolla is a new artist to you – you can learn a lot about how he worked from this video. Click the link below to receive a time limited special pre-release price. But don't wait. This discount will end the day after its official release, Monday, April 16. Great explanation. I'm looking forward to the video. Just a quick question. If Red is generally considered warmer than blue and purple is blue and red mixed, why is blue not considered cooler than purple? An excellent question Michael. You'd think that since the visible spectrum is arranged like this: ROYGBIV – as we were all taught in our high school physics class – that Red would be considered the warmest (longest wave length) as compared to Violet (being the shortest wave length we can see). And Yellow would fall somewhere in between. I don't have a satisfying answer to this conundrum yet. Beyond the fact that the Warm yellow/Cool violet model works best in paint and the French Impressionists touted it so much. (And Hawthorne, and Hensche, and so on...) But I think the color of light is complicated by how we, with our own eyes, retinal receptors, and brain, register color stimuli. How we interpret that stimuli isn't fully understood yet. Frankly I wish I'd understood color tempoerature better 30 years ago when I first started painting. Back then I was almost completely value-based and tended to poo-poo the idea myself. Then, about ten years ago I started seeing it in master paintings, coordinated with light and shadow massing, and from there, started seeing it in real life. I can never understand why so many artists classify phthalo blue as cool and ultramarine blue as warm, intuitively it seems the opposite to me, and also on your colour wheel. Thanks for the great article. This effect of colours in shadow/light is currently my favourite thing in all art, I hope I am able to get your video. 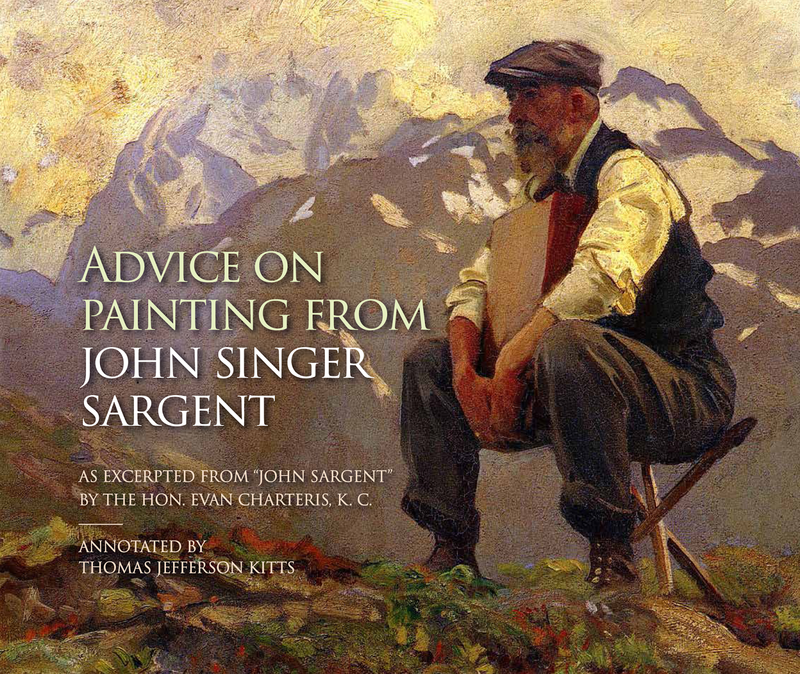 I've been obsessed with J. S. Sargent for this reason for several years; Sorolla is a new artist to me, I will definitely be trying to learn more. I wish I could see hidden colours more easily! Actually Outdoor Painter just posted an interesting article 'Is Ultramarine a Cool Blue? 'An artist made the observation that painters who have a red bias think ultramarine blue is a warm color, but it's cool to folks with a yellow bias. That made sense to me, I've always had a yellow bias, and think Ult Blue is cool. I have plenty of painting difficulties, believe me, but I can see colors in reflected shadows quite naturally. But controlling the application, and the value of them is the struggle. I just purchased your video, it will be great to study your insights! Will you be discussing overcast light as well? Quang Ho calls it Local Tone, but it's tough to translate cloudy days- I seem to key too dark and dull, and there's not enough contrast in such scenes. Also that rule 'everything in the light is lighter than anything in shadow'; will you touch upon that as well? For example I tried to paint dark blue irises in full sun- it still looks like a beautiful dark purple blue in light. I saw some orangy edges in the flower, but could not make it read convincingly. That's OK if these are not touched on in the video,there will be enough to study! But perhaps you can write a blog sometime on these topics. I began painting about 9 years ago, and you were one of the first artists I studied, and have always appreciated your writing and generous explanations- thank you! Judy, my apologies for taking so long to reply. Been busy, both preparing for PACE 2018 and thenbeing at the convention itself. I understand your confusion. And perhaps why you are confused. We've been (incorrectly) taught since kindergarten that the "warmest" hue was either orange or red, and that the "coldest' hue was blue. So making this change to your existing concept of temperature can be, and is, difficult. Remember, temperature is NOT inherent to any hue. Temperature is the relationship BETWEEN two or more hues. It either requires two (or more) hues to exist, or, two (or more) sources of light to exist. All I know is that the yellow/violet model works best in paint. I really don't know why, but it does. And no, I was not the first artist to discover this principle. The yellow/violet thing goes back many generations so I just accept it. I haven't gone into overcast light in detail yet. Because it is easier to explain the warm/cool direct sun/blue sky relationship first. (Plus, I have been studying Sorolla for the video as of late.) Once you can see the warm/cool color of light thing, the far more subtle, but equally important cool/warm thing becomes easier to grasp. But in a nutshell, on an overcast day the primary light (from the sun positioned above the clouds) is filtered and turns cooler by the time it reaches the ground. (Think of that layer of clouds being an extreme form of atmospheric perspective. More of the yellow and red part of the spectrum is being being filtered by the clouds.) As a result, on the ground we 'perceive' cool lights and warm shadows. The opposite of what we have been discussing in this post. Overcast light is actually more complicated to explain than the more straight-forward sunlight/skylight thing, so I will save the cool/warm thing for another day. Thanks for purchasing my Sorolla: Painting the Color of Light DVD set. It is the first extended video instructional I have produced and I have plans for more. David, I read your page and found it to be quite interesting. Thank you for posting it. Good stuff. And at this point I would agree with what you've written, as far as I understand it. Yes, my understanding of color temperature has changed dramatically over the past five years, largely due to the information I have now, and my appreciation as to how the French Impressionists used color in their paintings. Can I tell you (or anyone else) WHY Yellow and Violet work as the warmest and coolest set points for the Color Wheel? (Or rather, Hue Wheel, to be more precise) No, I cannot. I only know that when I mix my paint to describe the effect a certain temperature of light has on a 'local' color, that local color is either pushed toward the yellow or towards the purple, depending upon the temperature of that light. All of that impact is independent of Value shifts, or changes in Chroma as well. To me, in the end, the term temperature is best used to describe a relationship between two or more Hues. No single Hue has an innate temperature, and in that I think we agree.